A British Inventor called Richard Browning may end up being the real life Tony Stark after presenting a working Ironman suit. Every since he posted a video of his maiden flight in the UK, he’s had huge interest in his suit, but he maintains the project is just “a bit of fun”, and not intended to be a mainstream form of transport. Much like Tony Stark, Richard and his son have a flare for extravagant names, this iteration of the suit was named by his 8 yr old, as Daedalus, who is the father of Icarus who flew too close to the sun and burned. Hopefully that’s not an omen for things to come. Richard says he was inspired by his Aeronautical engineer and inventor father, who sadly committed suicide when he was a teen. 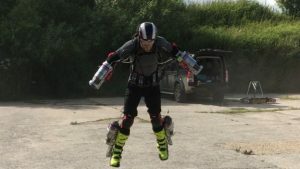 Both he and his father had always enjoyed a challenge, when asked about making the Ironman suit he told the BBC “I did this entirely for the same reason that you might look at a mountain and decide to climb it – for the journey and the challenge. My approach to flight was why not augment the human mind and body, because they are amazing machines, so I just bolted on what was missing – thrust.” The suit is controlled with his arms which control the direction and speed of the flight, apparently its capable of flying at 200 mph with an altitude of a few thousand feet, but currently only has fuel for about 10 minutes flight. I’d guess 10 minutes at maximum speed, and fairly low altitude, allowing for landing and take off, acceleration and deceleration should give him about 15-20 miles range, once perfected. A mile a minute in a suit is impressive, once the kinks are worked out and such speed is safe. 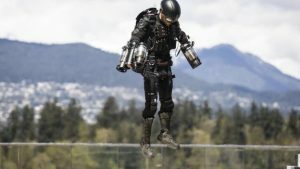 Mr Browning has founded a start-up called Gravity which is working on new technology to further the Daedalus Suit which will make the current prototype look “like child’s play”. If you look at the original suit images from the maiden flight in Wiltshire, UK, you can see how much the suit as progressed and can only imagine how far it will come with all the funding, especially now the UK military is investing amongst others. 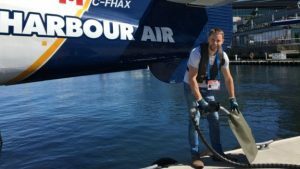 One of the more interesting images shared online shows, issues importing the particular fuel his Daedalus Suit uses in to Canada, he had to borrow fuel from air planes in the Vancouver Harbour. Looking at the size of his fuel “tank”, you could imagine a sort of metal backpack fuel tank, like the 1990s film the Rocketeer, could double or triple his fuel supply and things would get interesting. Images Copyright of Richard Browning.